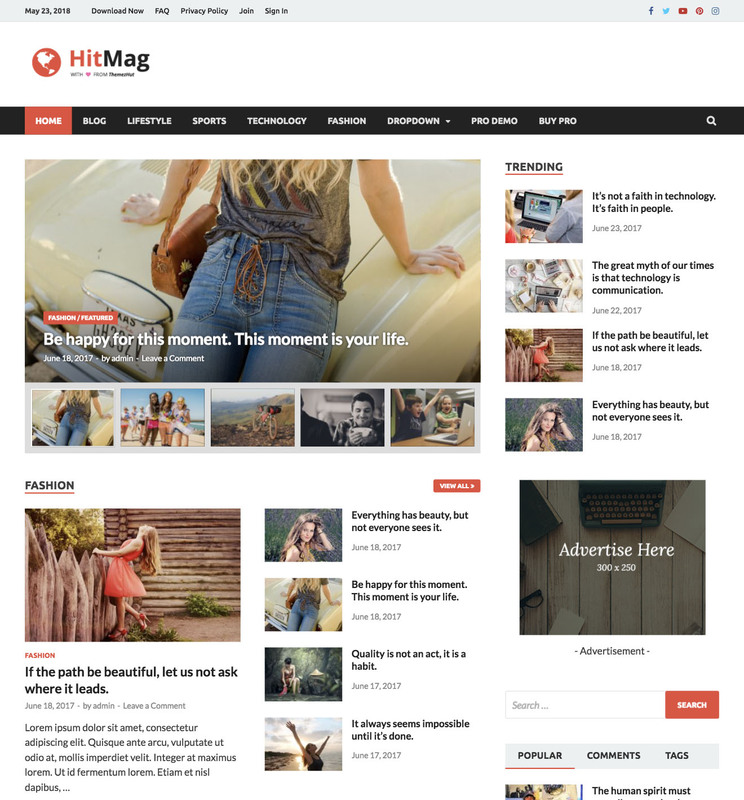 HitMag is a stylish and powerful theme crafted for magazines, newspapers or personal blogs. HitMag comes with a handful of options to customize your site the way you want. The free version has included a magazine homepage layout, 4 different style blog listing layouts and main color options. Not only that it comes with so many handful of features like social sharing, author details box, Related posts after articles and control post metadata. All those features and options ensure that HitMag is not just another free WordPress theme but a powerful theme that fulfills all of the basic needs. HitMag WordPress theme has included an image slider to give a nice impression of your site and display important posts highlighted. You can display latest posts or latest posts from a category on the slider. Thumbnail navigation of the slider helps the user to get an idea what kind of information each slide display. HitMag has provided four different layouts to list your blog posts. And not only layouts it gives the options to select sidebar and content alignment for blog, posts, and pages globally and internally. The free version comes with a magazine homepage widget area and three great posts widgets to display your posts in a categorized and organized manner. Around 75% of the users will launch to the internet via mobiles in 2018-19 according to sources. So you should make sure your site displays properly in mobiles. 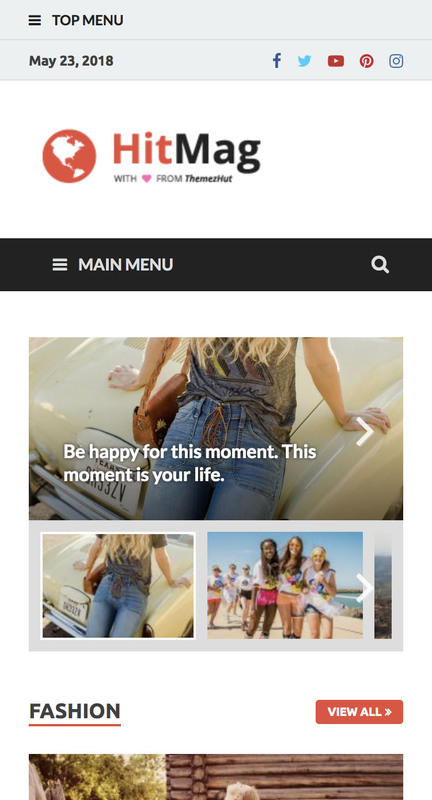 HitMag WordPress theme is fully responsive. So no matter what is your reader’s reading screen size, your site will display nicely. Our number one responsibility is to provide secure, reliable and fast themes for users. Our themes including HitMag has built with the latest coding standards and practices. That is why our themes have been listed in WordPress.org. You can easily do tasks like logo upload, change background color/image, change theme color, change post listing layouts, add custom CSS, setting homepage slider, etc, just from the customizer without touching a single line of code. * Removed unwanted files and folders. * Added social media sharing functionality. * Added custom color feature. * Fixed few escaping issues. * Added few controls to the customizer. * Added an editor stylesheet. * Added "view all" buttons to category posts widgets. * Fixed mobile menu not disappearing issue. * Hitmag Popular posts, tags, comments restyled for footer. * All the widgets are now working on any sidebar except header advertisement area. * Removed block styling for <q> tag. * Removed social media buttons. * Header sidebar renamed to Header Advertisement Area. * Posts widgets styled for footer. * Used escaping functions for translation. * Removed social sharing function. * Used get_templated_directory instead of dirname in functions.php. * Fixed anonymous function issue. * Fixed some escaping issues. * Removed wp_reset_query() function on related-posts.php. * Fixed an issue in header image. * Changed the youtube icon in social media menu. * Changed max-height in header sidebar. * Fixed a issue in custom color option. * Fixed white space issue on header. * Fixed the theme primary color control issue with WordPress 4.9. * Updated the translation file. * Fixed some styling issues in blog posts listings. * Added search box to the mobile navigation menu. * Added stylings for default widgets. * Changed the header sidebar height. * Added some stylings to WooCommerce. * Fixed some issues in mobile navigation. * Added two page templates to be used on page builders. * Fixed "Read More" button's active state color issue. * Fixed footer widget links hover state color issue. * Renamed "sticky posts" widget controls. * Fixed layout issue when there is no posts on "HitMag_Single_Category_Posts" widget. * Updated Popular Posts, Comments, Tags widget to display only approved comments. * Used (document).ready() method instead of (window).load() method for slider. * Used localized date method instead of date on top bar. * Fixed the layout issue that comes when adding elements inside posts. * Added new theme hooks to be used on child themes. ** PRO labeled features are only available in PRO version.